Both U.S. and Canadian authorities warn of a ‘major loss of life’ from future oil train crashes. WASHINGTON — Warning that a “major loss of life” could result from an accident involving the increasing use of trains to transport large amounts of crude oil, U.S. and Canadian accident investigators urged their governments Thursday to impose new safety rules. The unusual joint recommendations by the U.S. National Transportation Safety Board and the Transportation Safety Board of Canada include better route planning for trains carrying hazardous materials to avoid populated and other sensitive areas. 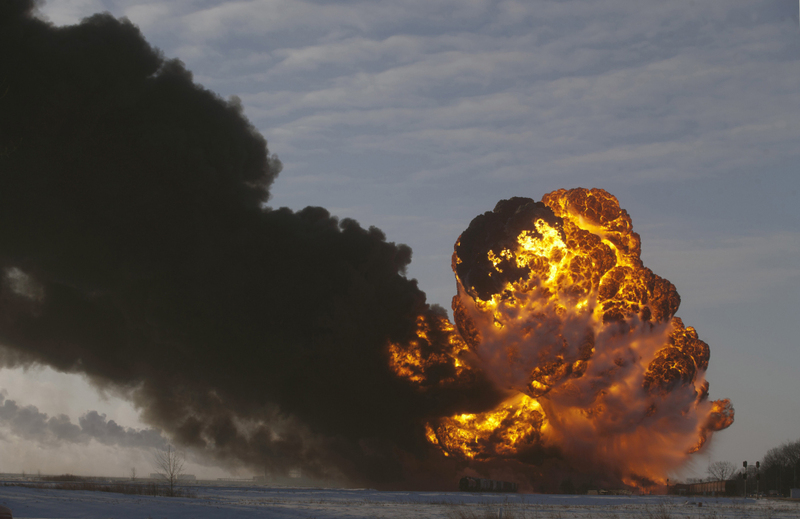 Last month an oil train derailed and exploded near Casselton, N.D., creating intense fires. The accident occurred about a mile outside the town, and no one was hurt. Rail lines run through and alongside the town. In July, a runaway oil train operated by the Montreal, Maine & Atlantic Railway derailed and exploded in Lac-Megantic, Quebec, near the U.S. border. Forty-seven people were incinerated and 30 buildings destroyed. That train was on its way to Maine to deliver oil to a refinery in Saint John, New Brunswick. Rep. Mike Michaud, D-Maine, whose district includes several towns on that route, said it’s critical that agencies from the two nations were in agreement because railroads cross national borders. “The good news is that you’ve got both countries’ safety boards recommending the same thing,” he said in an interview. There was only one crew member on the train involved in the Lac-Megantic disaster. Michaud in August submitted a bill that would prohibit railroads from using one-man train crews. Michaud said he initially didn’t get much interest in Congress for the legislation. But recent accidents, such as the derailment in North Dakota, have raised awareness about the dangers posed by the oil trains. He said he now has 50 co-sponsors. Rep. Chellie Pingree, D-Maine, said in a statement that there is a lot more crude oil traveling by rail through Maine than there was a decade ago and that she doesn’t believe communities along these routes are adequately protected by current regulations. She said it’s now up to Congress or the Obama administration to turn the recommendations by the NTSB into regulations. “I think it makes sense to see if there is bipartisan support for these common sense safety regulations but we are also going to push the administration to take action without waiting for Congress,” she said. Sen. Angus King, I-Maine, said in a statement that he fully supports the recommendations and urges federal agencies to implement them immediately in order to help prevent a tragedy. In its report, the NTSB noted that crude oil shipments by rail have increased by more than 400 percent since 2005. Some oil trains are more than 100 cars long. “The NTSB is concerned that major loss of life, property damage and environmental consequences can occur when large volumes of crude oil or other flammable liquids are transported on single train involved in an accident,” NTSB said. Transportation Secretary Anthony Foxx met with oil and railroad executives last week, pressing them to come up with voluntary changes in the way oil is transported to increase safety. He asked industry officials to report back to him within 30 days. Edward Hamberger, president of the railroad association, reaffirmed the freight rail industry’s commitment to moving oil safely by train in a speech Thursday to energy and financial industry executives. “We share the secretary’s sense of urgency and want to help instill public confidence in rail’s ability to meet the demand for moving more energy resources in this country,” Hamberger said in a summary of his speech provided by the rail association. U.S. crude oil production is forecast to reach 8.5 million barrels per day by the end of 2014 – up from 5 million barrels per day in 2008. The increase is overwhelmingly due to the fracking boom in North Dakota’s Bakken region. U.S. freight railroads transported nearly 234,000 carloads of crude oil in 2012, up from just 9,500 in 2008. Early data suggest that rail carloads of crude surpassed 400,000 in 2013, according to the Association of American Railroads. Freight rail lines across the U.S. frequently run through densely populated areas, from small towns to large cities. Many of the lines were laid out in the 19th and early 20th centuries. The NTSB noted that it is still waiting for final action from government regulators on recommendations made in 2009 regarding improving the safety of tank cars used to transport oil and other hazardous materials.